LOCAL PICK-UP AVAILABLE IN TEMPE NEAR TEMPE MARKETPLACE! PICK-UP AVAILABLE Monday -Friday 8am-4PM. New factory sealed Virgin refrigerant made in USA. IF YOU DO NOT HAVE CERTIFICATION , YOU MUST SIGN A STATEMENT WITH YOUR FULL LEGAL NAME STATING YOU INTEND TO RE-SELL THE REFRIGERANT TO A CERTIFIED PERSON. 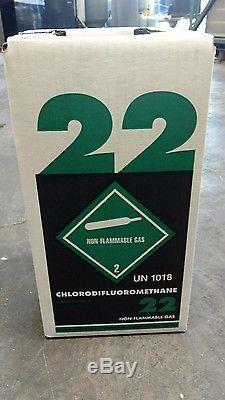 The item "NEW R22 refrigerant 15 lb. Factory sealed Virgin made in USA LOCAL PICK UP ONLY" is in sale since Friday, March 9, 2018. This item is in the category "Business & Industrial\HVAC\Other HVAC". The seller is "abilityrefrigerants" and is located in Tempe, Arizona. This item can't be shipped, the buyer must pick up the item.